My family does a fair bit of traveling. My husband loves to plan trips, to the extent that my friends have dubbed him Travel Agent Ken. (Does that make me Luggage Hauler Barbie?) TAK, as he is affectionately known, thinks nothing of driving from our home in Central New York state to the New York City area for a Broadway show, a college visit, or a soccer game. Any excuse to pop down to the Big Apple will work for him. The rest of us are not as enamored of the whole bright lights, big city thing, but we can always be lured into the car with the promise of one thing: a visit to Sheetz. Sheetz, for those not lucky enough to have visited, is a chain of convenience stores located across a half dozen states. They are not found here in NY, but when we drive through Pennsylvania to reach NYC, there is one at the perfect halfway point. We pile out of the car, gas up, hit the restrooms, and then venture toward the big attraction: the food. Yes, my family will happily drive hundreds of miles for the chance to belly up to a counter equipped with touch screens where we can custom order sandwiches, burgers, drinks (I crave their iced hazelnut nonfat lattes), and other greasy goodness. This makes absolutely no sense. We know that. None of us can really explain the appeal. It might be those touch screens, that let us choose exactly what toppings we want on our cheeseburger sliders. It might be the fact that we are almost always in a good mood when we're there, heading off to a family vacation but not yet thoroughly sick of each other. It might even be that the food is just so darned good. 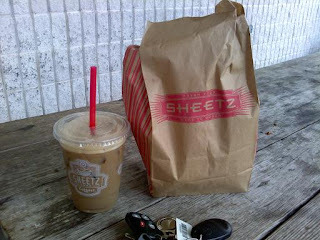 All I know for sure is that this past weekend, while driving home solo from the fabulous New Jersey Romance Writers conference, I stopped at Sheetz for lunch. I texted my youngest son with the taunting message, Guess where I am right now? His reply: If you don't bring home something from Sheetz I am disowning you as my mother. So tell me – what is your (or your family's) guilty pleasure? Funny. I think I know exactly which Sheetz you're talking about. Is it in Clarks Summit? My family stops at the Krispie Kreme right next door to the Clarks Summit Sheetz when we are traveling to Philly or NYC. That's our guilty pleasure. Our not-so-guilty, but oh-so-amazing pleasure is the Italian deli in Clarks Summit. Fantastic sandwiches, and just perfect for the trip HOME from a vacation when we've already had too many "guilty" treats. Have you introduced yourself? Can I introduce you? Kris Fletcher and I are in the same Romance Writers of America (RWA) chapter, Central NY Romance Writers. I met Kris at my very first chapter meeting and she's been an excellent friend ever since. Kris is wise, warm, and so very funny. She has a bunch of wonderful children, she's a dedicated volunteer, and I'm almost 100% sure she owns a feather boa. She's definitely been seen at the Liverpool Public Library wearing a feather boa, so ownership is really beside the point. Kris recently sold to Superromance and her first book is coming out in 2013. Maybe she can tell us a bit about that book? Hint, hint. Welcome to the Super blog, Kris! Nice blog, Kris! Our family's guilty pleasure? The Clam Bar, where there are mounted fish and other animals on the wall, and we eat snow crab legs, oysters, and German Renata chicken wings. (you've never had chicken wings until you've had these) No, we don't order healthy vegetables--just a bunch of our favorite appetizers and share. Guilty pleasure - chocolate chip bagels from Panera. I second Ellen's request - tell us about your book!! Thanks for hanging on the Super thread on eHarl too. Ellen and I would travel well together. Krispy Kreme is our guilty pleasure. We don't have one within 150 miles, so when we go on the road, we indulge. DH has been known to perform an illegal U-turn (in a 40-ft. motorhome) to get back to the turnoff where we spied the HOT sign! Welcome to the blog, Kris! Hmmm, our guilty pleasure at this time is Yogurtland :) We've been known to make a 50 mile rd trip to get some! Welcome to the Super blog and to Super Romance! Can't wait to read your debut!! I will leave the Krispie Kreme all to you. As a born & bred Tim Horton's gal, KK is just too sweet for me. Though I must admit I love watching the donuts go through that glaze waterfall. I might have to get the address of that deli from you for or next trip - assuming I can drag the family away from Sheetz. And thank you for that lovely intro, which is WAY better than I could have done. You are too wonderful. Emma, I'll let you indulge in the crab legs & animal heads, but I might have to wrestle you the ground for those wings. There is a time and a place for veggies. A clam bar is not it. Marcie, chocolate chip bagels? From Panera? And I have missed them all these years? Snookie, oooh. Is that a yogurt place with different toppings, mix-ins, etc? Love those! Beth, I think I am traumatized by trying to imagine the plural of Sheetz. It seems like it should always be said in the singular. You know, like Cher or Madonna, only with more reverence. Frozen coffee sounds sooooooooooo tempting!!! I must remember that for our next journey! Yup, Kris, it's different flavors of soft frozen yogurt where you can mix in your toppings. I like the plain tart yogurt mixed in with coconut yogurt. I usually top it with chocolate chips, sliced strawberries, sliced li hing apples, coconut flakes and chopped macadamia nuts. MMMMMM, I want one right now! WE love road trips. We like to stop at the Red Hut Waffle Shop in Tahoe on our way east. And my husband, who hates to shop, loves to shop at Fred Meyer, because we don't have them here, and he only shops there on vacation. We also start every single road trip with Jimmy Buffett's "Cheeseburger In Paradise." We've only actually eaten a Jimmy Buffett cheeseburger once on vacation, when we went to Orlando for my Mother-in-law's 70th birthday. Another road trip tradition that I have come to tolerate is when my husband takes the plastic lid off his empty soda and flings it across the car at me. Used to drive me nuts, but 20+ years later, since I'm still driving with him, I guess I'm come to accept it. Welcome Kris. Look forward to your book. Our October roadtrip is to... Ferndale, Wa. (dsil can do his eyeroll here.) For Brach's "Mellowcreme Pumpkin"s. I didn't know they actually had a name (wikipedia -http://en.wikipedia.org/wiki/Brach's). Can't have October without them and we can't get them up here anymore. Oh, Snookie, that sounds amazing. No wonder you'll drive 50 miles for that! Mary, if you're going to indulge, pizza is definitely the way to go. Mmmmm. Whereabouts in the Great White North are you, approximately? I'm still Canadian despite decades living south of the border - grew up in the Hamilton area (all my family is still there) & went to school in Nova Scotia. Oh, and my book is set in the Thousand Islands! Kristina, I laughed so hard about the flinging soda top that I almost woke the kids. Too funny. Waffles. Oh yeah. And love the musical start to the vacation (great choice!) I have one that I play on every writing retreat/conference weekend - the title is I Don't Have To Be Me Til Monday. Love associating memories with music. Linda, oh, I haven't had one of those little pumpkins in years, but I know exactly which ones you mean. They're so cute! Yummy, too, but so cute that the yumminess almost takes a back seat. Oh, that sounds like a really cool place! Guilty pleasure for us and dining out at a "fancy" restaurant. My boys like a little fanciness at times...and those baskets of rolls they bring with the "hard" butter. Every now and then, we try to take them out for something other than Buffalo Wild Wings so they learn how to use correct table manners rather than their fingers. I personally cherish the time it takes for that sort of meal - good time to connect...and usually there is wine in it for me. LOL. Kris, I'm from southern Ontario, too! And I've visited Nova Scotia, which I love. Gorgeous province. How intriguing that your book is set in the Thousand Islands. I'll be sure to pick it up! It's so great to see you here as a Super author! As long as I have known you, I have never heard you mention Sheetz. To think I have miss out on all that fun (and grease). I'll think that I'll arrange a consultation with TAK for directions. I love the Thousand Islands, too! Regretfully, I never made it up there this summer. Congratulations on your first Harlequin Superromance! Can't wait to read it and get an autographed copy. Yee-haw. Liz, wine and hard butter always make for a memorable meal. And you're right - those opportunities to teach the kids their company manners can make for some very special nights. Mary, thanks, and oooh, we have shared stomping grounds!I always love that. Mrs. Wenger, you know that TAK will happily give you detailed instruction in Sheetz-finding. I didn't make it to the Thousand Islands this summer either. Road trip next year together??? I've never heard you mention Sheetz either, Kris! It sound like my kind of place. I confess, my guilty pleasure when I travel is Dunkin donuts. Can't pass one without getting a medium decaf-skinny-hazelnut latte. Boy-o-boy, it was a looong two weeks in California this summer with only Starbucks on every corner! Now I wonder, what other guilty pleasures we can get you to share? Oh, Susan, is that latte hot or iced? Because it sounds completely decadent. Pour it over ice and I'm there!